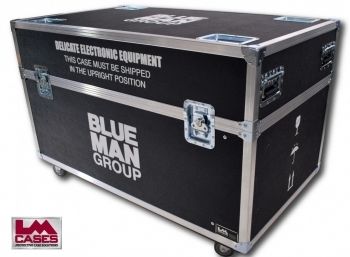 This case was built for the Blue Man Group to house 2 elements of their Akira video wall. The case is designed to hold 2 Akira AML4601ZM units with their wall mounts attached to allow for easy rigging. 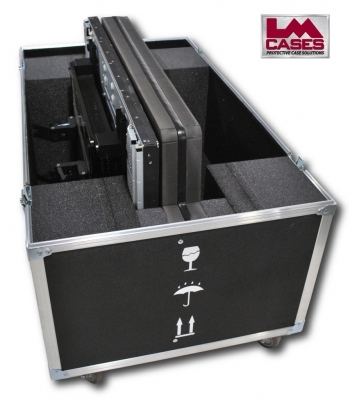 The design features a 3/4" birch center divider with 2" Crosslink foam on each side to protect the monitor screens during transport, loading the monitors in this fashion allows the mounts to be on the outside of the case for easier removal. 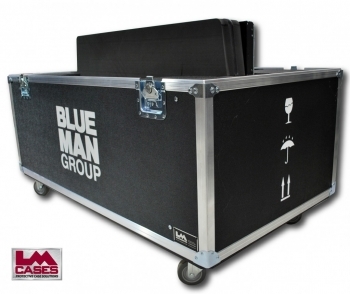 The case is built out of 3/8" plywood, and features 3.5" Colson casters, deep recessed handles, stacking caster wells, and a custom silkscreen of the Blue Man Group logo. Special thanks to the Blue Man Group!